Cool Circuits is an electronic puzzle developed by Harry Nelson and Hiroshi Yamamoto. The object is to place the 8 squiggly pieces onto the board to form a closed loop. When you are successful, the board lights up and some classical music is your reward. Games Magazine awarded it as the Puzzle of the Year in 2013. This game's been on my mind for 5 years! But I've finally gotten around to it. I've tackled 27 of the 40 levels. Multiple times I peeked at the solutions to get a hint. 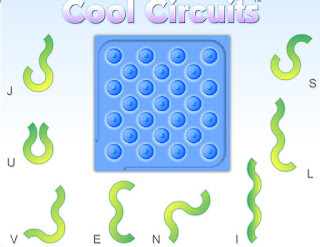 There is a sequel called Cool Circuits Over the top. Which mysteriously is not on the company website. I have the game but have not played it yet. It won't take another 5 years.